My husband sent me this article with humorous intent, but I find it very interesting. It's an Adobe Acrobat file that I saved as a JPG, so I'm not sure it'll copy here - and the copy I have is pretty messy looking. It's an excerpt from Savvy and Sage Maagazine, but I don't know which issue. Hopefully, you can read this. 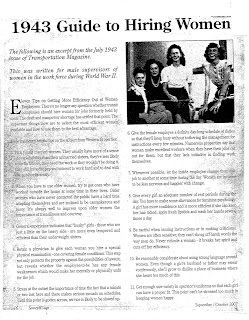 It contains tips for men having to hire women during WWII. As I read through the tips, I realized that women in general were not used to working outside the home. Hence the need to give them solid instructions because they don't tend to find work for themselves to do - what we call today a "self starter". Evidently, in 1943, women in general weren't the best employees and their shortcoming had to be recognized in order to get a good days work out of them. The sensitivity issue has never gone away. Women are more sensitive, and it becomes a pain in the neck at times. Instead of just walking up to a female employee and giving her instructions, you have to stop, say hello, ask how she is doing, how is her family, etc. I usually don't do that - I just cut to the chase, which is why I'll never be "employee of the year". In any case, this article is a glimpse into a world where women didn't HAVE to work outside the home, and, as such, didn't HAVE to be tough. This is really funny. I plan to pass along to my staff tomorrow. Thanks for sharing.